Tin-Tan, was a Mexican actor, singer and comedian. He often displayed the pachuco dress and employed pachuco slang in many of his movies, some with his brothers Manuel "El Loco" Valdés and Ramón Valdés. He made the language of the Mexican American Pachucos famous in Mexico. A "caló" based in Spanglish, it was a mixture of Spanish and English in speech based on that of Mexican immigrants. 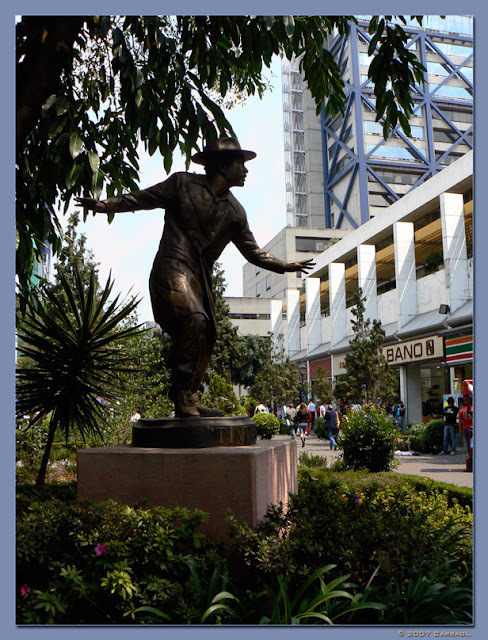 He usually acted with his "Carnal" (sidekick), Marcelo Chávez, who also accompanied Tin Tan with a guitar. He was a very important figure during his golden years of movie making, from 1949. His 1948 movie, Calabacitas tiernas, a comedy, was chosen as one of the best in Mexican cinema. He has the record of having kissed the most actresses in his career, some of them the beauties of their day. Some of his co-stars were Marga López and Rosita Quintana. He was also one of several people who were originally intended to be on the front cover of The Beatles' Sgt. Pepper's Lonely Hearts Club Band but were ultimately excluded. He requested that Ringo swap him for a Mexican Tree, and he did.